Timothy Corrigan’s tag line “A World of Comfortable Elegance” tidily sums up his distinctive design ethos. Known for his fusion of European elegance with California comfort, he is a master at incorporating elements from all eras. 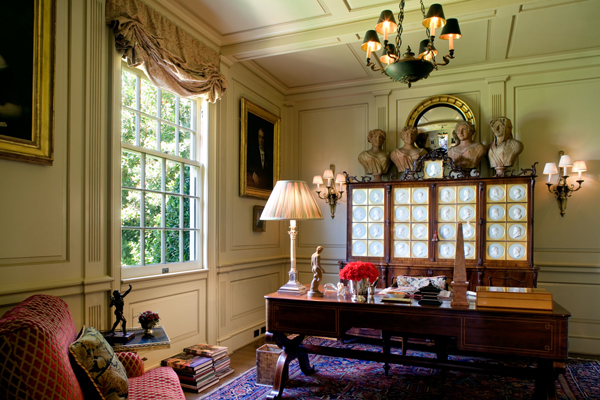 A consistent fixture on the AD100 list, with luxury projects around the world, Corrigan is known for his extensive use and knowledge of antiques, hence the perfect person to consult for a primer on acquiring and living with antiques. While I had originally intended this post as a follow up to the Winter Antiques Show, the mix of old and new is a frequent topic in these parts and a timeless theme. Although Corrigan’s projects are always laden with antiques, his designs discourage using them in a precious way. 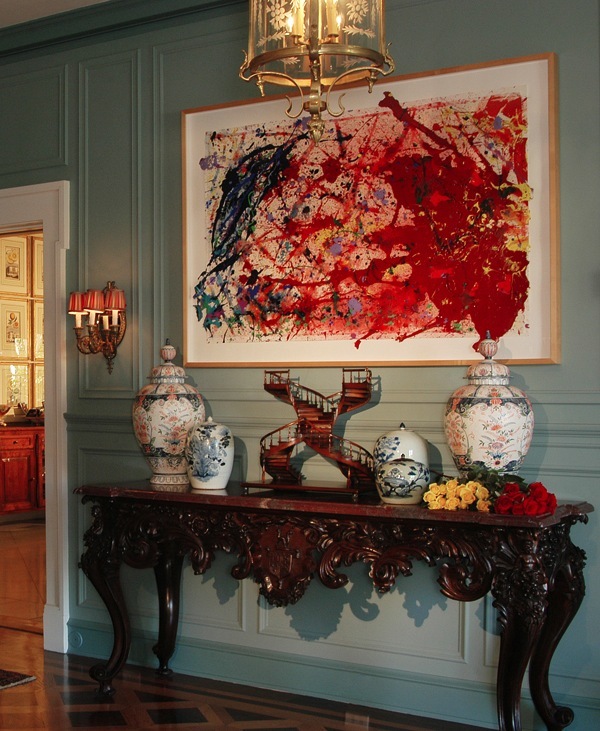 His rooms frequently feature unexpected matches like the Sam Francis painting over an 18th century Irish table, above. And while the table most likely has a pedigree, Corrigan promotes buying antiques at all price points for use as is or to suit your needs. Think of how often we’ve seen a dresser repurposed as a bathroom vanity or antique ceramics used as lamps. He stresses that antiques can be affordable as well as a good investment especially when sourced at auctions and flea markets. In fact, Corrigan frequently uses roundels. “I love using large roundels in rooms (whether they be marble, carved wood, zinc, plaster or even resin) because they provide a wonderful three dimensionality to the wall in a way that paintings cannot. 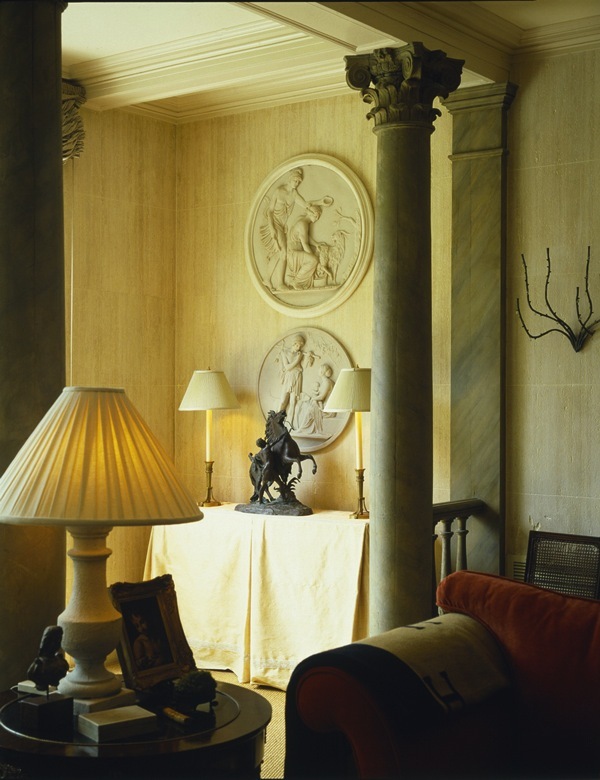 The relief sculpture on roundels provide a subtle almost grisaille-like effect to a room that does not fight with anything else that is going on in the room.” And I love how in the room above they function as almost an architectural entity. Yet below, they become more decorative in this noteworthy office, mixed with other significant objets. 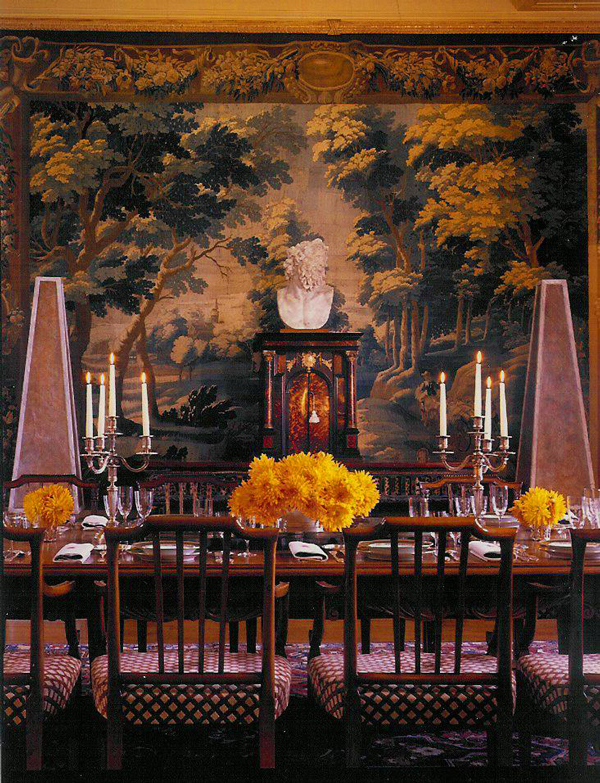 “The cabinet was a gift from the King of Holland for Catherine the Great’s private apartments. The porcelain roundels depict all of the great Greek and Roman Gods and Goddesses…and note that Catherine is placed at the very top, above all of the rest. 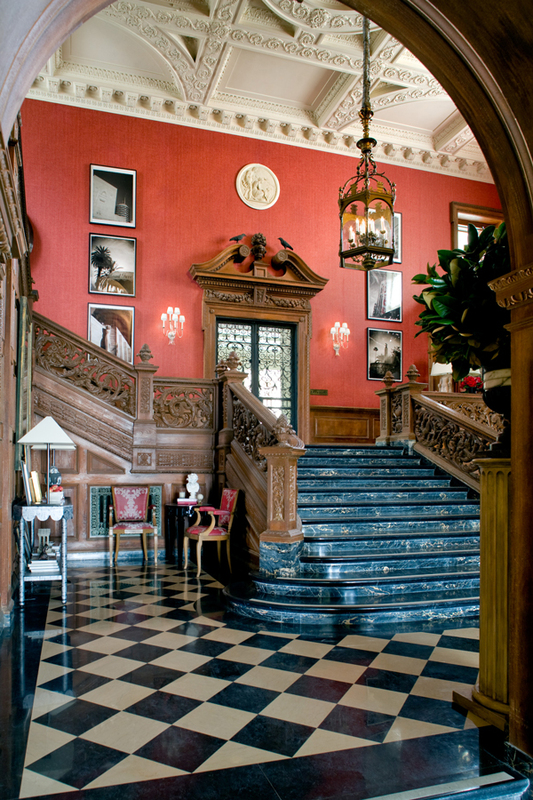 On top of the cabinet are terra-cotta busts depicting the Four Seasons.” Quite the collection! 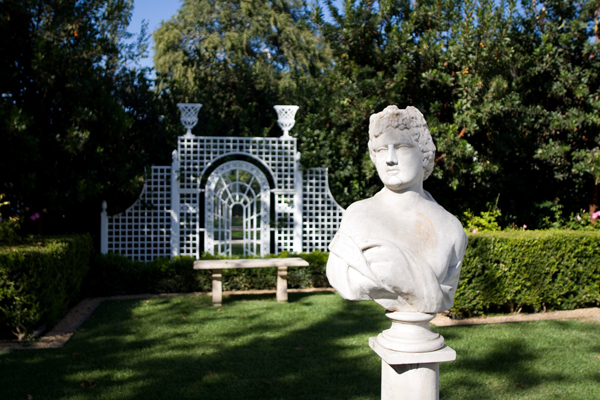 Like the busts in the formal library or garden above, sculpture is a sometimes overlooked antique source that Corrigan frequently incorporates into his designs. I particularly like how the white marble of the bust below bridges the gap between the modern white upholstery and the antique boiserie. Stop by tomorrow as we continue our conversation with Timothy Corrigan about designing and living with antiques. This entry posted in architecture, art, design, furniture, garden, interior design. Entry Tags: antiques, Collecting, Decorating, interior design, Timothy Corrigan Bookmark the permalink. BTW, her antiques are happier too! I have always loved Timothy’s work! Absolutely stunning! Thank you for sharing, Stacey. That is an art to add such depth and layers to those grand spaces. Thank you. Glad you are able to appreciate the layering I try to impart in all of my projects. Adore such successful mixes of modern abstract art and gorgeous antiques like that Irish hall table! Bravo to Timothy Corrigan and Quintessence for posting! Thank you Lisa. I like mixing disparate elements, I think the tension brings a room to life. Love this posting! Gorgeous photos and inspirational text. So glad we have more to look forward to tomorrow. Beautiful! And that tapestry… to die for! This is a great interview. Corrigan has remained true to his rich aesthetic. Can’t wait for tomorrow. Timothy Corrigan’s style makes the most modest or the most grand space look as though it was always luxurious and hospitable. And his interviews echo his style–no pretense! Here is a designer who loves what he does and wants you to thoroughly enjoy your home–with your feet up ! Fabulous! More!!!! Wow – thank you Annie! Timothy is brilliant. His style is timeless. He loves his work and we love him! Timothy Corrigan is a master! He is superb at what he does and he is an absolute joy to work with. The homes he creates are exquisite, livable works of art. His taste is sublime. I look forward to having him turn my new apartment into a heavenly, gorgeous home. It’s great to see antiques used in rooms that aren’t complete period pieces. Those kinds of rooms have their place, but for most of us, it’s about finding a way to include beautiful things of the past with beautiful things of the present—and in a way that’s comfortable and livable! Corrigan does a great job of it. Thanks for sharing this—looking forward to part II ! As usual, Tim continues to inspire and create the most stunningly beautiful interiors that we all aspire to be surrounded by. Thank you Charlotte for your very generous words. Tim’s a gem! I adore working with him on his Midwest projects. His taste is exquisite. 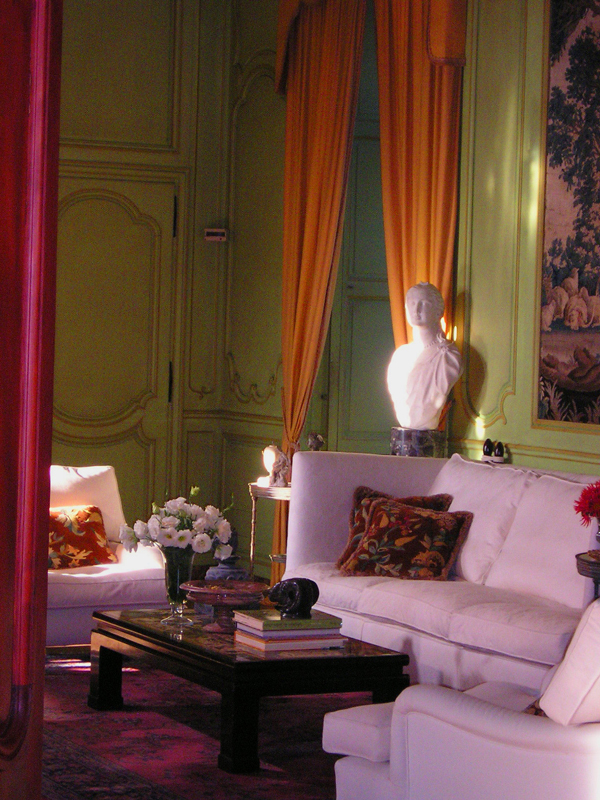 We’ll be using Grand Luce , his fabulous chateau in France ,as home base for our design tour this Fall. We can’t wait! Thanks Deb – looking forward to your visit! Grand Luce is such a wonderful showcase for Tim’s work–this elegant chateau is at once comfortable, welcoming and an absolute delight as new treats of color, texture and history peek from every corner. We stayed there with a large group once, and we cannot wait to go again. It has to be the best site I’ve ever seen for a wedding or large family gathering. As the pictures show, it’s absolutely enchanting. Thank you Jim. Hope you’ll return soon! Wow..Love the juxtaposition of the old and new..so vibrant, yet elegant..great ideas here.. Thanks Alex. Hope you’ll put the ideas to use in your own home! 82 queries in 0.551 seconds.